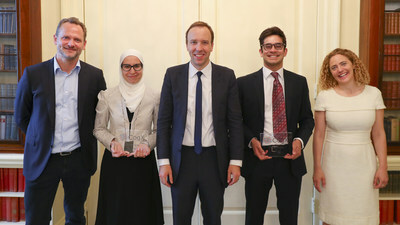 Following the 2018 CogX Awards earlier this week, Prime Minister Theresa May announced the final two UK Rising Star winners at an exclusive reception held at Number 10 Downing Street last night to showcase Britain as the best place in the world to run a tech company. Noor Shaker, CEO and co-founder of GTN, for her work using deep learning and quantum physics to transform drug discovery and support the treatment of chronic diseases, with a focus on oncology. Noor recently closed a seed funding round of approximately $3 million, and has well-established partnerships with The Francis Crick Institute and the UK government's Medicines Discovery Catapult. Dhruv Ghulati, CEO and co-founder of Factmata, for his work using human-assisted AI to tackle fake news, abusive content, hate speech and propaganda on the internet; and score the credibility and quality of media information in almost real-time. Founded in January 2017, Dhruv has already raised $1 million in seed funding from billionaire Mark Cuban, Twitter founder Biz Stone and Zynga founder Mark Pincus, among others. Prime Minister Theresa May said: "It's a great time to be in tech in the UK, and our modern Industrial Strategy will drive continued investment, ensuring the nation flourishes in the industries of the future and creating more high-paying jobs." Following the presentation by Prime Minister Theresa May, Dhruv Ghulati said: "Despite being only 10 months into our journey, this award is recognition that the UK tech sector wants us to succeed. I am hugely proud of my team for the strides they have made in launching our first AI products, and excited about continuing to tackle one of the major challenges of our time - online misinformation." 2018 CogX Rising Star Award winner Noor Shaker said: "AI has the potential to disrupt drug discovery through access to better medicines, addressing neglected areas such as orphan diseases and reducing the cost of developing medicines. We very much appreciate the recognition of GTN's efforts in that direction and we are very excited about the PM's agenda that recognises the challenges and rewards innovations in this field. We are also very happy to have a base in U.K. and in being part of a strong ecosystem that facilitates access to high quality talent, expertise and capital." The CogX Awards, held on Monday 11th June and hosted by CognitionX, celebrated the best in AI from around the world, and saw the winners joined by more than 300 guests at a gala dinner to raise awareness of the incredible work that is being done in the industry. CogX presented over 50 awards this year, including industry achievements across 18 different sectors and technical achievements across 16 different domains, as well as for contributions to research and academia, and outstanding leadership in ethics. The 2018 awards were held as part of the CogX AI Festival during London Tech Week. A festival of all things AI, CogX brought together 6,000+ people from technology, business, academia and the media across a packed two-day schedule including keynotes from Baroness Joanna Shields, Group CEO of BenevolentAI, and Jurgen Schmidhuber, the "father of AI". Following the hugely successful event, CognitionX co-founder and CEO Charlie Muirhead said: "Having so many AI and industry experts in one place really reinforced the challenges and opportunities that we're facing; AI is at a tipping point. Organisations need to define their strategy and start deployment, not in 10 years, but right now. This is why we've launched our AI advice platform to transform the way in which knowledge and expert advice is accessed. Web search has many merits, but organisations need advice specific to their needs across departments. Sometimes they may even have the expertise internally, but often end up turning to consultancies for this." "We have a unique opportunity to catalyse adoption of artificial intelligence in the UK," added Tabitha Goldstaub, co-founder of CognitionX. "Our platform helps to remove the barriers to deployment, by reducing the time it takes to make decisions and find the right AI services to use. As industry and government gain more confidence in implementing AI, we will see the technology adopted more often and more successfully. As long as the challenging ethical considerations are understood, AI is designed responsibly, and the benefits fairly distributed, this will lead to a brighter future for the country." About CognitionX: CognitionX is the AI Advice Platform that connects organisations with a global on-demand network of AI experts. The platform allows experts in AI from the around the world to share invaluable expertise with organisations of any size and sector who want to tap into that knowledge. Founded in 2015 by Charlie Muirhead and Tabitha Goldstaub, CognitionX's mission is to bring clarity to, and accelerate adoption of, AI across all organisations from global enterprises to startups, and help ensure a safe and responsible transition to an AI-driven society. Through its freemium model, CognitionX's expert network helps level the playing field, by making scarce AI expertise accessible to all, and provide a new way for experts to monetise their knowledge. About GTN: GTN is a multidisciplinary, innovation-driven company, searching the astronomically large space of drug-like molecules with its unique patented technology, Generative Tensorial Networks. The software combines and builds upon techniques from machine learning and quantum physics to simulate, filter and search for molecules, discovering molecules entirely hidden from view. GTN has already demonstrated state-of-the-art prediction of molecular characterisation. This is a critical step in the hunt for new drugs outside of the crowded space being mined by more traditional methods. The team at GTN are currently running collaborations with global pharmaceutical companies, with a number of the ten largest pharmaceutical companies in their pipeline, and have strong partnerships with world-leading research bodies including the Francis Crick Institute. About Factmata: Factmata's mission is to protect people, advertisers, publishers and brands from damaging, deceptive or harmful content online. Factmata combines cutting edge AI with the knowledge from expert communities to build explainable algorithms to score subjective aspects of content such as argument bias. Factmata has just launched an alpha version of their community platform, Briefr, targeted at expert journalists and domain experts. The team's quality scoring technology is also being tested in commercial pilots with major ad tech giants including AppNexus, Sovrn and Comscore, major ad agencies and large social media platforms to be announced soon. They are backed by some of the leading investors in the world including Mark Cuban, Biz Stone, Mark Pincus, Craig Newmark, Larry Braitman and Sunil Paul, and have raised $1m to date.